I hope everyone had a fabulous Thanksgiving with your family and friends. I know I did! I spent most of the day on Wednesday in the kitchen prepping for our feast. Although I don’t remember what I ate most of Wednesday, I know I ate clean. Thursday was a long and tiring day. My legs were tired from spending most of Wednesday night prepping the bird. Once Thursday came around, I had my coffee in hand and was ready to cook cook cook! First in the oven was the turkey! I bought the pasteurized turkey from Marin Sun Farms. 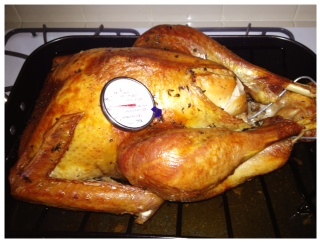 I brined the turkey on Tuesday for a little over 24 hours in Apple & Spices Turkey Brine. Once that was done, I washed the turkey, took the skin apart and rubbed ghee all over it. Then I covered the bird with White Tuffle Oil and sprinkled it with salt. After 3.5 hours in the oven, it looked like this! I made Nom Nom Paleo’s gravy to go with the turkey…NO FLOUR!! 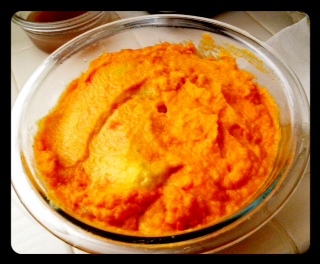 The next thing I made was a Carrot & Cauliflower Puree. We took the turkey and puree to my Mom’s house for our first thanksgiving dinner. Unfortunately, I did not eat any of the good stuff. I had was enticed by these cookies that my sister bought from a fundraiser. I know….GASP! 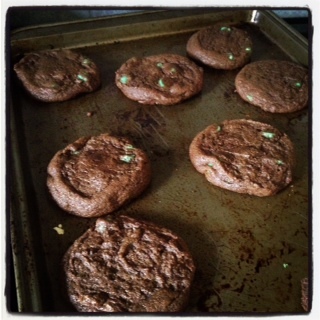 I probably had a few pieces of turkey as my mom was cutting it, but other than that, I had 6 or 7 of Mint Chocolate Chip Cookies. SIGH! Major FALEO! We had to go to the in-laws a few hours later and I brought some Braised Cabbage with Paleo Pumpkin Gingerbread Cake courtesy of Melissa J. Um, I tried the crumbs as I was cutting the squares and they were delicious. For my second thanksgiving dinner, I had a piece of chicken with boiled broccoli and cauliflower. I honestly was not hungry and felt very guilty for eating so many cookies. I was trying to be polite and nibble a little. Then I left the table to play with the kiddies. Friday, I had the sugar hangover. Nothing I ate kept me full, and I thought about carbs all day. Yes, the bad sugary kind. For breakfast I had leftovers with Philz Coffee. For lunch I had leftovers, turkey and puree. I did not want to eat more turkey leftovers and carrot puree for dinner. What did I do…got the husband to go get some Vietnamese sandwiches. SIGH! I almost made it through the day eating clean, but I had a Grilled Pork sandwich with pate. It was yummy and I don’t regret it. I’m lucky I made it through the day without a COOKIE! LOL. In hindsight, I guess a sandwich wasn’t a bad idea because it gave me the carbs I was feening for without the sugar that a cookie would have. On Saturday we hosted a party for our friends. I ordered a turducken from 4505 Meats. It was a small one, where they deboned everything and rolled the 3 meats together with cornbread stuffing. Honestly, it wasn’t that great. The idea is great, but there wasn’t a WOW factor to it. Maybe because we didn’t get the Grand Turducken where the birds are left intact. Along with the turducken, I made a sirlion tip roast. 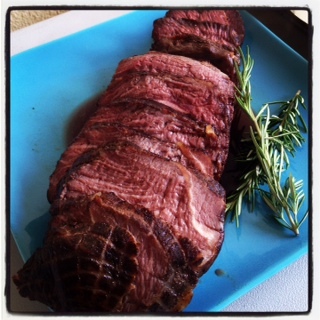 Actually, I didn’t have to do much, the Sous Vide Supreme did most of the work. I let the roast sit in there for 12 hours. It turned out perfect! I also made another batch of braised cabbage and for dessert, the pumpkin maple bars. This time, I had a few maple bars, and that was as close I got to for dessert. My friends ate it all up, and was really surprised to know that there was no flour in the bar. They kept saying it’s healthy it’s healthy. Not really…it’s just made with real food! BTW, for those who saw me take a pic with a beer…yup I did..but I didn’t drink it. 😉 It’s an inside joke for preggs! I’m surprised I didn’t go eat cookies or bundt cake. They were there, I just didn’t touch it. I did end the night with some bone broth and dark chocolate. I was pooped, but definitely worth it! Sunday I stayed on the straight and narrow, even though I thought about sugar all day too! What’s up with that?!?!?!? Luckily I escaped the day without baking any cookies and stuffing them in my mouth. Very LUCKY! Hope everyone doesn’t have any trouble getting back to the grind. I was reminded this weekend that everyday we have on this earth is a gift and we should spend that time doing something great. BE GREAT! And be thankful! 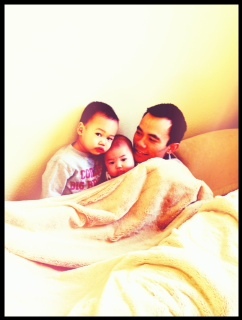 Here’s a little pic of the boys playing.